To me book authors are 1) those who are discoverers, 2) information assemblers, and 3) the name pasters. The discoverers and truth seekers, and uncoverers, who then write to share with as many individuals as possible amongst the citizens of the world. Information assemblers who are able to notice good bits, and pieces them up together in a form of a book. The name pasters, and also known as plagiarists, who take a good book, cut out the name of the author, and replace the spot with his' or her's. Throughout the all time best of success literature, I have observed the following individuals who fit the first category of exceptional book authors. My choice are: Wayne W. Dyer, Napoleon Hill, Stephen R. Covey, Zig Ziglar, Og Mandino, Dennis Waitley, Shad Helmstetter, and Anthony Robbins. To me, these individuals are originators, who discovered an aspect of the total picture. As a result of their works, we are seeing more lights. An enlightenment now, after the previous endarkenment. 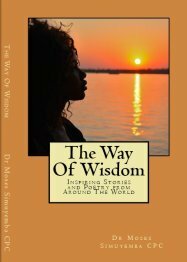 What you, Dr. Moses Simuyemba, has done here, is opening up a dimension where dreamers are able to realize their visions to be who they really are. * Our Interactions May Make This A Better World To Live In. Dr. Moses Simuyemba, Please Keep Up The Good Works. Join in and write your own page! It's easy to do. How? Simply click here to return to What People Say.